One of the biggest questions faced by many people who are relocating to Florida is whether they are better off to build a new home or buy an existing one. While there are advantages to both options, building a new home has certain key benefits that just can’t be matched when buying an existing one. Here are the seven top benefits of building a new home instead of buying a resale. When you choose to build your new home from scratch, you get to build it the way you want it. You will have the option to choose the ideal floor plan you want and you will also be able to choose the materials and color schemes that fit your personality. We have 6 brand new floor plans for Terra Vista. Another big selling point for new home construction is that you will have the ability to personalize many aspects of your home. Adding features like a pot filler above the stove or a particular type of recessed lighting in a certain spot are easy to integrate when they are added before the walls go up. Should anything go wrong with your new construction home in the first few years, it will almost certainly be covered under your warranty. The same cannot be said with a resale home, where what you see is often what you get and you could be opening yourself up to tremendous risk if something goes wrong down the road. Whether you are selflessly concerned about protecting the environment or more interested in protecting your bank account from high energy costs, the modern green technologies that will be included in your new home will actually be able to do both! Your new home is sure to have energy efficient appliances, and it may also feature energy saving technologies in its roofing materials, windows, and ventilation system. Building a new home instead of buying a resale also guarantees that you are on the cutting edge of the most modern style and design in the industry. 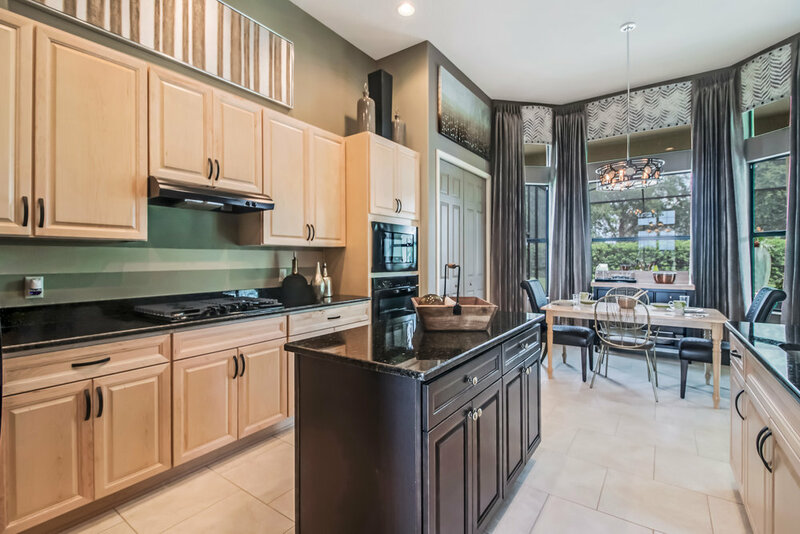 At Villages of Citrus Hills you will have all of the design features that are popular today like granite countertops, open concept kitchens, elegant master suites, and covered lanais. Simply put, new homes will require less maintenance. Your home will already have a fresh coat of paint and a brand new roof, air-conditioner and appliances, so those types of maintenance projects and replacements will not be necessary until years down the road. You will also be able to design your landscaping in a way that can help you save on maintenance there as well. Another advantage of purchasing a new home is the feeling of knowing that you are the only person who has ever lived there. You won’t have to ever consider what might have happened in the home before you lived there. Everything will be brand new and built just for you. Building a new home from the ground up gives you the ability to create the home of your dreams where every detail matches your expectations. While there are pros and cons to both building a new home and buying a resale, for most people the benefits of building a new home far outweigh any potential drawbacks. The process of building a brand-new home here at the Villages of Citrus Hills can be a fantastic experience, but it isn't necessarily an experience that is right for everybody. For a lucky few, purchasing one of our model homes can be a much better option. Because all of the model homes are designed to impress, most of them come with all of the additional features. On top of that, they are obviously already built, so they make an excellent option for anyone who doesn't really want to wait through the construction process. Being able to buy one of the builder’s model homes anywhere is a rare occurrence, but if getting into a brand-new home that comes with all kinds of bonuses sounds appealing to you, take a look at these four options that are currently available here at the Villages of Citrus Hills. The Kingston model home is currently available for $524,900. The Kingston is a cozy three-bedroom, two-bathroom home with a study that covers 1,936 square feet of climate-controlled living space. You'll love making dinner in the open-concept kitchen, and you'll REALLY love taking a bath in the master-suite jacuzzi tub! Actually, there isn't anything you won't love about this adorable home. The Somerset model home is currently available for $599,000. The Somerset is a larger option that adds a third bathroom and 700 square feet of additional living space. And most of that living space is located in the dining room area that sits between the open kitchen and the huge living room. You'll also find an upgrade master suite that will have you feeling like you are walking into your own personal spa every time you take a bath or shower. The Winchester model home is currently available for $699,900. With three bedrooms, three bathrooms, a study, and just over 2,600 square feet of climate-controlled living space, The Winchester is pretty similar to The Somerset at first glance. But a deeper dive will reveal that this home is something extraordinary. Since it was built to showcase all of the outstanding upgrades available here at the Villages of Citrus Hills, you will find that The Winchester has gorgeous cabinets, elegant ceilings, and a perfect breakfast nook. And then you head outside to find a covered, in-ground pool! The Windham model home is currently available for $679,900. The Windham is the largest and most impressive model home that is currently available. With three bedrooms, three and a half bathrooms, a family room, and almost 3,000 square feet of climate-controlled living space, there is more than enough room to spread out and relax here. It also has all of the exciting features that we saw in The Winchester, including the pool. And after doing a few loads in this beautiful laundry room, you might actually start to enjoy washing your clothes. Whether you are looking to go big with a model like The Windham or The Winchester or keep things more reasonable with The Kingston or The Somerset, these four model homes are a tremendous opportunity to purchase a move-in ready home complete with all the bells and whistles here at the Villages of Citrus Hills. Contact our sales team today to schedule a viewing and let us welcome you to the neighborhood! When you choose to build your new home from scratch, you get to build it the way you want it. You will have the option to choose the ideal floor plan you want and you will also be able to choose the materials and color schemes that fit your personality. Building a new home instead of buying a resale also guarantees that you are on the cutting edge of the most modern style and design in the industry. At Citrus Hills you will have all of the design features that are popular today like granite countertops, open concept kitchens, elegant master suites, and covered lanais. How Much House Do You Really Need in a Retirement Community? With all of the amenities available to residents at the Villages of Citrus Hills, planning to spend your retirement years here is an easy decision to make. But where things get a little more complicated is when you have to decide exactly how much house you are going to need once you are living here in Florida. In most cases, you will have a good general idea of how big of a house you are looking for, but we have learned over the years that spending just a little extra time weighing the pros and cons of going a little bit larger or a little bit smaller can be the difference between an almost perfect retirement and one that actually is perfect. If you are struggling with deciding exactly how much house you are going to need in your retirement years, we suggest taking some time to talk through each of the following five concerns to see how each of them might impact your new lifestyle. Where Do You Spend Time? 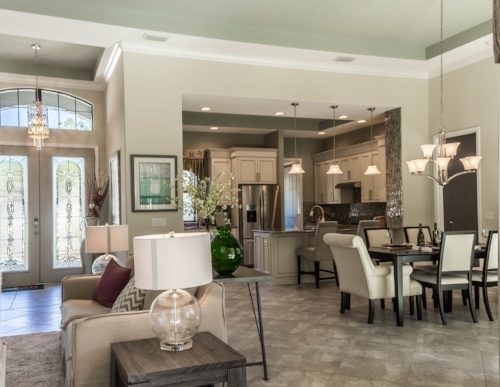 One of the biggest differences in the floorplans here at the Villages of Citrus Hills is the size of rooms like the great room, kitchen, and master bedroom. Depending on where you typically spend the most time, you might realize that you would like just a little bit more space in one of these places. Of course, if you are the type of person who expects to spend the majority of your time out in the community or kicking back on your lanai, then any cost associated with upgrading these interior spaces will be a wasted expense. Will You Be Hosting Guests? The most common reason that many residents choose to go a little bigger on their retirement home is that they are expecting to host guests on a regular basis. Whether we are talking about long-time friends, children, or grandchildren, having an extra bedroom or two when hosting visitors is always going to be a plus. Speaking of extra bedrooms, if you are considering picking up a new hobby during your retirement years, you will definitely want to make sure that you have plenty of room to explore your projects without leaving clutter all over the house. Crafting, puzzle building, and woodworking are all popular retirement community hobbies, and they all require plenty of extra space. And even hobbies like reading and writing can be much more enjoyable if they have their own space in your home. The first three questions probably got you thinking about pushing towards a slightly bigger retirement home, but the counterargument that you have to consider now is whether you can actually afford that extra space. In addition to being able to afford the house itself, it is also important to keep in mind that larger homes will be more expensive in terms of maintenance and utilities. How Do You Feel About Maintenance? Speaking of maintenance, another great point to consider is that there are many options like the Care-Free floorplans at the Villages of Citrus Hills that include all of the necessary exterior maintenance on your home. That means you won't ever have to bother with cutting grass, trimming the hedges, or exterior painting. But if you're the type of person who enjoys that type of work (aka crazy), you might not find much value in a home where someone else does the work for you. Determining the right size for your retirement home is a complicated process that really boils down to analyzing your lifestyle, contrasting it with your budget, and finding the home that best fits those two together. And here at the Villages of Citrus Hills, we have options to cover just about any conclusion you reach. The new year has finally arrived, and what better way to celebrate it than with a brand-new home! If you are the type of person who is ready to make a dramatic change in a hurry, one of the move-in ready showcase homes available at the Villages of Citrus Hills might be the perfect fit for you. Before we take a look at the details of what types of floor plans and neighborhoods are currently available, let's first take a few minutes to review some of the reasons that opting for a move-in ready home might be a better fit than building your Citrus Hills home from scratch. The most significant advantage to choosing to purchase a move-in ready showcase home here at the Village of Citrus Hills is that you won't have to waste any time waiting for your new home to be built. With everything already finished, there simply aren't any construction delays or unforeseen complications to worry about. Another advantage to choosing a move-in ready showcase home is that you won't have to bother with making any decisions about what features you want in your home. In many cases, some of the best features that we offer here at the Villages of Citrus Hills will already be included in those homes. There are currently two Amherst floor plan homes available in the Brentwood neighborhood. These two-bedroom, two-bathroom homes have a total of 2,420 square feet with 1,666 square feet of living feet. They offer a large great room with an attached kitchen and breakfast nook area, as well as a great master suite. The Brentwood neighborhood also has three move-in ready showcase homes modeling The Cromwell floor plan. 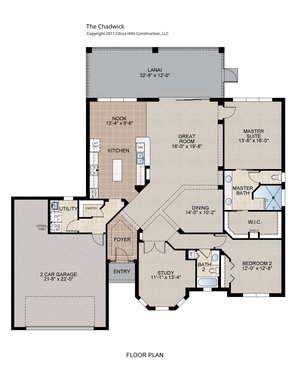 This layout is actually quite similar to the Amherst floor plan, but with 2,620 total square feet and 1,798 square feet of living space, everything here is just a little bit bigger than it is in the Amherst and has a dining room. If you have a bigger budget and are looking for a deal on a slightly bigger home, you might want to check out some of the move-in ready showcase homes in the Terra Vista neighborhood. Here you will find three Fairmont floor plans, which are also two-bedroom, two-bathroom homes, but everything is just a little bit more spacious. There is also a special floor plan in the Citrus Hills neighborhood that is an absolute must-see. Whether you have the budget for this one or not, you have to check it out just to appreciate the amazing possibilities here at the Villages of Citrus Hills. 2018 is sure to bring a host of exciting possibilities to anyone who is willing to pursue them. If you have always dreamed of moving to Florida, these move-in ready showcase homes can be the perfect opportunity to make that dream a reality before we get too far into the new year! Click on the link below to view details and pricing on our Showcase Homes. Deciding to retire to a new home here at the Village of Citrus Hills is one of the best decisions a person can make. But that decision is also going to lead to some additional choices. One of the most significant follow-up decisions that you are going to have to make is choosing which floor plan is the perfect fit for your family. There are an incredible number of options, and all of them come with popular features like open floor plans, spacious lanais, and stunning master suites. However, there is a subtle difference between each selection that can really improve the quality of your life here at the Villages of Citrus Hills. To help you find the perfect floor plan for your Florida lifestyle, we have put together five simple decisions that will help you identify exactly which option is right for you. Do You Want to Mess with Maintenance? One of the biggest differences between the floor plans here at the Villages of Citrus Hills is that some options include exterior maintenance and others leave that work to the new homeowners. If you don’t enjoy yard work, you will love the freedom that comes with our Care-Free Home. Residents in these properties never have to worry about any exterior maintenance on their properties, so they can spend more of their free time enjoying our activities and events. How Many Bedrooms Do You Really Need? The most obvious difference between many of the floor plan options is the number of bedrooms. Having extra bedrooms can be great if you need space for hosting guests or setting up your own craft room, but too much space will end up being more hassle than it's worth in the long run, so be careful not to go overboard. Some of our nicer floor plans include entire guest suites, which could be a great choice if you plan on having friends and family visit on a regular basis. Do You Need a Separate Dining Space? Another feature that often ends up as wasted space is having a separate dining room. Our floor plans have a number of different dining room layouts, and some are more isolated than others.If you expect to have formal meals, this could be a nice feature. However, if you are the type of family that prefers to eat in the kitchen or in front of the TV, a separate formal dining room probably isn't necessary. How Will You Use Your Kitchen? The kitchen is another area of the home that varies quite a bit between floor plans. While all of the floor plans are going to have an open kitchen, the look and feel of those kitchens are quite different. People who spend a lot of time cooking in their kitchens are going to require a lot more than people who just use the kitchen for the refrigerator and the microwave, so make sure that the kitchen in the floor plan you choose is going to fit your lifestyle. How Much Outdoor Space Do You Want? All of the floor plans here at the Villages of Citrus Hills come with a fabulous outdoor space. But the size of those spaces can vary pretty dramatically depending on the specific floor plan you are looking at. Residents who expect to spend a large portion of their time outside often gravitate towards the floor plans with larger lanais. No matter what floor plan you choose to go with here at the Villages of Citrus Hills, you are almost certainly going to be impressed with the end result. However, finding the perfect floor plan for your family could be the difference between a good retirement and a great one. Choose wisely! Whether you are downsizing, upsizing, or just looking to head south and avoid the cold winters, there is a good chance that you are going to find yourself with a little bit of extra space in your new home at the Villages of Citrus Hills. Every floor plan we offer contains at least one spare bedroom, and with many offering more than one extra bedroom and some even adding a study, many of our residents find themselves overwhelmed with space that they aren’t quite sure what to do with! In order to make sure that you are getting the most out of your spare bedrooms in terms of both storage and functionality, we put together a list of six great ideas that can quickly turn any extra bedroom into your new favorite room in the entire house! The most common use for a spare bedroom these days is for a home office space. Just about everyone today has a desk and a computer, and the spare bedroom is usually the most reasonable place to set up shop. But if you want to make your home office really special, spend some time and effort tweaking all of the details to get it to function just the way you like. Depending on how you plan on utilizing the space, this could mean anything from a larger desk and big filing cabinets to extra shelving for all of your favorite finance books and paper clip holders. One popular twist on the home office is to create a room that is dedicated to all of the tools and supplies you need for your favorite hobbies and crafting projects. This could be as simple as an extra table set up with a few plastic bins of supplies, or it could be as elaborate as an all-out workshop. Whatever hobby or craft sparks your interest, having a designated place to pursue that passion is a wonderful luxury that will help you devote even more time and effort to perfecting your craft. Mental activities like yoga and mediation have been rapidly growing in popularity over the past few years, and having a dedicated space to work on your practice is one of the best ways to commit to that type of inner development. While these practices don’t require much more than a simple mat on the floor, you can certainly improve the zen aspects of your spare room with some plants or a small fountain. If you are anything like most people today, even a large walk-in closet just isn’t enough space for all of your clothing and accessories. That’s why using one of your spare bedrooms as a dressing room makes so much sense! Even if your clothing does fit in the large walk-in closet, having a room dedicated to accessories, make-up, and full-length mirrors can be a wonderful oasis when getting ready. Every serious reader has a collection of old books that can fill a few boxes. If you happen to be one of those people that has more than a few books, get those boxes out of the garage and up onto some shelves in your spare bedroom. Add in a comfortable armchair, and you’ve just created your very own library that can double as a quiet space to think! With all of these exciting ideas for getting the most out of your spare bedrooms, it can be easy to overlook the most obvious options like simply making the room into a place to accommodate guests. If you are going to be hosting friends and family from time to time, you want to be able to offer them comfortable accommodations, so keep that in mind when deciding on what to do with your extra bedrooms. Each of these six ideas can be a wonderful way to utilize the space in a spare bedroom on their own, but you are likely going to find that you want to utilize the space for more than one function. If this is the case, keep in mind that you don’t want one function to take away from the other, and make sure everyone in the house is on the same page with respect to what the room is supposed to be. After that, let your imagination run wild in all of that open space! A cozy neighborhood that's comfortable and inviting, with friendly neighbors and ample amenities – that’s how residents characterize Brentwood of Citrus Hills. It’s a neighborhood that’s not too big, but a size that feels just right. Here you’ll find a sense of community where sensible stylish homes, scenic views and a convenient Nature Coast location come together to form a way of life that’s a pure pleasure. Like the neighborhood of Terra Vista, residents here enjoy the many amenities of the Citrus Hills Golf and Country Club. In addition, there is a challenging nine-hole golf course, fitness center and heated outdoor pool within the gates of Brentwood. Our Move-In ready Showcase Homes are perfect for those who have sold their homes, or know their homes will sell quickly and are ready to relocate, or those looking for a new home without going through the construction process. These finely crafted new homes feature our time-tested floor plans and popular designs. Loaded with extras that people love, our Showcase Homes also offer standard features that are considered upgrades at other communities. For value, luxury, and style our Showcase Homes should be seen and considered. A LIFESTYLE CONSULTANT CAN ANSWER YOUR QUESTIONS. CALL TODAY! 800-511-0814 OR SCHEDULE A TIME TO VISIT US. SEE OUR SHOWCASE AND MODEL HOMES AVAILABLE FOR IMMEDIATE OCCUPANCY. Set atop the highest point in Citrus Hills – and one of the highest elevations in all of Florida – is Terra Vista, the pinnacle in refined resort-style living. Its impressive gated entry and lush landscaped boulevards reveal immediately to visitors the kind of lifestyle Terra Vista embodies. This is a neighborhood focused on a relaxed way of life and a commitment to comfort. Unlike some Florida developments where homeowners feel right on top of their neighbors, Terra Vista’s distinct villages of architecturally compatible homes create an atmosphere of privacy. Sprinkled throughout are the many club amenities, available to all residents, which promote a lifestyle filled with recreational fun and diverse social activity. Our Move-In ready Showcase and Model Homes are perfect for those who have sold their homes, or know their homes will sell quickly and are ready to relocate, or those looking for a new home without going through the construction process. These finely crafted new homes feature our time-tested floor plans and popular designs. Loaded with extras that people love, our Showcase Homes also offer standard features that are considered upgrades at other communities. 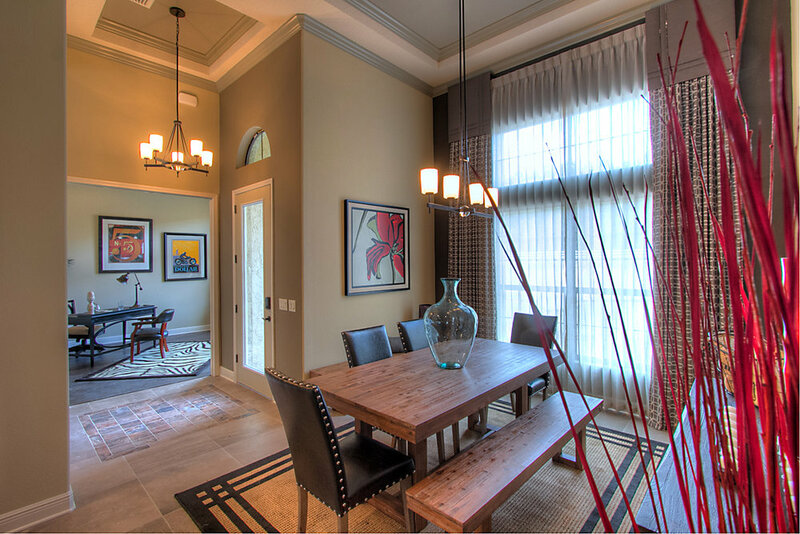 For value, luxury, and style our Showcase and Model Homes should be seen and considered. *Inventory of new Showcase and Models Homes is updated as new homes are constructed. *Pricing below includes homesite and home. One of the most common themes among many of the active adults looking to spend their retirement at the Villages of Citrus Hills is that they are looking to downsize into a home that requires as little maintenance as possible. After spending most of their lives living in bigger homes to accommodate their growing families, many of our residents prefer their retirement housing to be as simple as possible. Out of the 19 floor plans available here at the Villages of Citrus Hills, The Amherst is designed for those who are seeking simplicity. It packs a lot of popular features into 1,666 square feet of living space. Add in the two-car garage and back yard lanai and this floor plan has 2,500 total square feet. On top of being minimal in the square footage department, The Amherst is also one of our Care-Free Homes, which means that you won’t ever have to worry about any exterior maintenance. Everything from mowing the lawn to painting the outside will be handled for you for as long as you choose to live here. Let’s take a walk through this simple home and see how it’s laid out! Standing in front of The Amherst, the two-story entryway is right in the middle of the house, with a large window placed right above the front door. On one side of the front door is the two-car garage. The other side of the house is a large window that looks out from the second bedroom. As you pass through the entryway and into the home, you will find yourself standing in the foyer with the guest bedroom and guest bathroom off to one side of the house. Continuing straight back will take you right into the great room that makes up the heart of the home. There is also an owner’s entrance through the two-car garage that passes through the laundry room and into the great room right next to the foyer entrance. Standing in the great room, the open floor plan of The Amherst allows you to see right into all of the other common rooms. On the same side of the home as the guest bedroom and guest bathroom, the kitchen area takes up the middle of the floor plan, and there is a small breakfast nook tucked at the back of the house. The kitchen includes an L-shape of cabinets against the back wall that contains the refrigerator and stove, while the sink is located in the island overlooking the great room. On the opposite side of the great room is a set of French doors that leads into a private study area. There is also a large lanai off the back of the house that can be accessed from the back of the great room, or observed through the large window behind the breakfast nook. Like many of the floor plans here at the Villages of Citrus Hills, you will find access to the master suite located at the very back of the great room on the side opposite the kitchen. The door leads right into the master bedroom, which includes a large window looking out the back of the house from just past the end of the lanai. From the master bedroom, we can turn towards the front of the home and continue down a short hallway that is flanked by two walk-in closets on our way into the master bathroom. Like everything in The Amherst, the master bathroom is straightforward, yet elegant, with a standing shower and his and her sinks. This is the ultimate escape for anyone looking to downsize into a home that has all of the features that they need, without overdoing it on all of the extra options. If that is the kind of home you are looking for, this is definitely the place to start your search here at the Villages of Citrus Hills. Take a look at our Callington care-free model available in our Terra Vista neighborhoods. It's a beautiful new home for anyone considering Florida. If you are looking for a decent size home that is focused on making its owners feel like royalty, the Rossetti should be on your list. Let's take a walk-through of one of our larger single family homes. Sophisticated charm designed to meet your needs. Would you rather buy an existing house in Florida or build a brand new one from the ground up? With the many floor plans available here at the Villages of Citrus Hills, deciding which one is the perfect fit can be a pretty big decision.